This article was written by Jack Bird on behalf of his client Steve Wood Services. 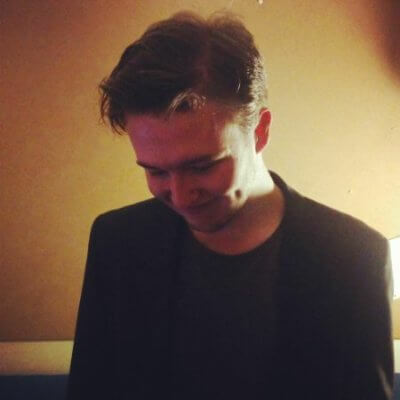 Steve Wood found his design company, Steve Wood Services, after a career in ink chemistry and print technology. He now supplies the city of York and beyond with a wide selection of screen and printing services. First, a moment to appreciate all the talented designers that have worked with alcohol companies recently. The big brands in the beer business are shaking in their collective boots, as the rise of independent and micro breweries means that their tame and repetitive designs are getting shown up by the inventive and stylish artwork of the new kids on the block. Below, you can find some of our favourite examples of these designs from around the world, and in probably no time at all, around your bloodstream too. For anyone that’s read a Hunter S. Thompson novel before, the art of Ralph Steadman above will probably ring a few bells. The off-the-wall designs will no doubt attract your eyes to it like a tractor beam; especially when stacked next to some of the more traditional bottles our eyes have grown accustomed to. They stick out like a thumping sore thumb, and for the people that love to photo what they’re drinking and broadcast it over social media – you might have a new favourite. For the record, you won’t be hearing much about the taste and texture of these beers. We’re very much judging a book by its cover; and it’s safe to say if Flying Dog was a book, it would probably be the Necronomicon. 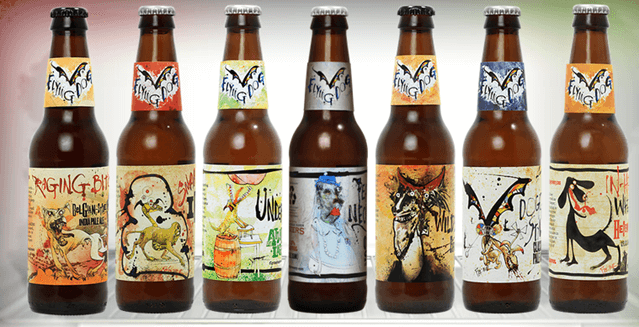 If you don’t like the look of one can of Flying Dog, you probably won’t like the rest, since they’re all made with the same iconic Steadman-style. Half Acre, impresses with the sheer variety of their designs. Running the gamut from ‘popping with colour’ to ‘devoid of any life at all’, you’re bound to find something you like within the arsenal of the Chicago-based brewery. This is also an advantage that smaller breweries have over the likes of Carlsberg and Fosters. While they might be too afraid to try radical new designs so they don’t alienate their audience or stray too far from their established brand imagery, brands like Half Acre can have all the fun they want. 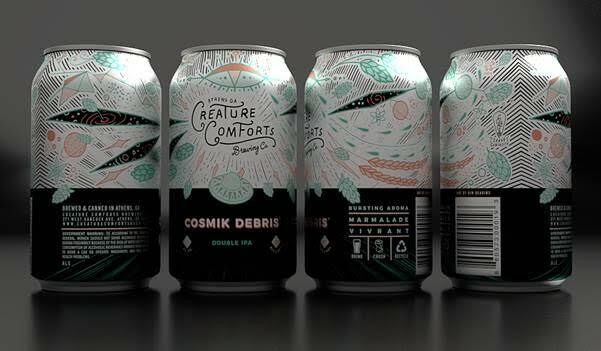 On their website, Creature Comforts talk about their “wide-awake creative impulse” which drives what they do, and they definitely deliver on the creative side of things with their cans. Ranging from the photorealistic to the out-of-this-world, it’s similar to Half Acre in that the team works with multiple artists to provide that schizophrenic styles that the brewery’s products boast. In the image above, we particularly like how the deep black of the bottom half of the can contrasts against the white above it, which looks like it’s exploding. To mix things up, Brown’s Brewing Co’s latest update features the order of geometric designs and patterns over the chaos of the wild designs we’ve already featured. The Oatmeal Stout evokes the sycamore trees of somewhere like Twin Peaks, whereas the symmetrical red pops of the Cherry Razz looks like a New Years Eve skyline. A combination of Brown and Flying, Bellwood tend to keep the number of colours used as low as possible, but never at the expense of the quality designs they wrap around their product. The Toronto-based outfit never shy away from skulls, snakes and the supernatural and they’re definitely one of the punk-ier brands here. One of their bottles reads ‘No rest for the wicked’, and I think Bellwood will agree with that. This respect of design for a once stale alcohol industry is a breath of fresh air, whether you’re interested in beer or not. We love the frosted glass of our local supermarket beer fridge looking like a portal into a local design exhibit, and this certainly isn’t a trend we expect to die down anytime soon. 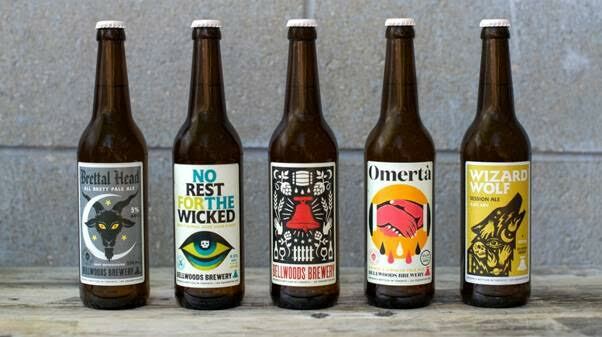 We’ve shown you a few, but we want to know what your favourite beer bottle and can designs are! Let us know in the comments below or over at the Everyday Designer Twitter and Facebook pages.